Great Gift for people that Entertain. The Set has 5 places for any Appetizer, with a place for Crackers on the side. It can also be separated to give more options in displaying food. 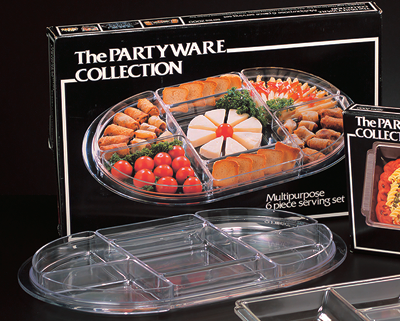 1 large oval tray,4 separate Appetizer trays, and 1 Tray with Appetizer space and 2 places for Crackers. (L) 19 3/4" x (W) 13 1/4" x (H) 2"